With all the great things I get to see and do by studying in Europe for a semester, not being able to come home for Thanksgiving is a major drawback. As easy as it is to make a good group of friends you can call a family, there’s nothing like sharing an outrageously large meal of family-secret recipes with people that have been in my life since birth. Thanksgiving is easily my favorite holiday, and going into the holiday season knowing I wouldn’t be able to celebrate with family was difficult. But what is the solution that American students think of when they know they will be missing a traditional American Thanksgiving? Cook one in Denmark. First things first, cooking Thanksgiving dinner is a process and a craft. Making dinner for 10+ people takes time, effort, and skill. Having spent much time in the kitchen while my mom cooked for Thanksgiving (though I wasn’t necessarily helping her out with the cooking), I knew it would take some time to make everything. Fortunately for me, one of my friends has a visiting family (sort of like a host family without having to actually live at the house), and this family offered to cook turkey and host a dinner for about 12 people. Everyone invited was then responsible for one or two dishes to bring to the meal. I will admit…I was really concerned about our ability to put this together. My friends from my Kollegium had never cooked a Thanksgiving dinner before, and we only began cooking just a few hours before the meal. Time was of the essence. 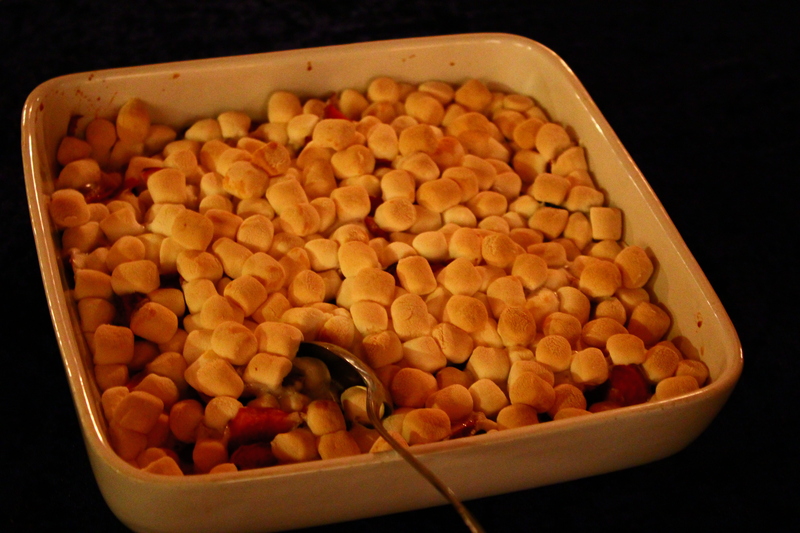 Despite the cooking experience I’ve gotten by living on my own while in Denmark, I had very little faith in my ability to cook a Thanksgiving specialty, sweet potatoes with toasted marshmallows, never having cooked a dish like this before. After getting the recipe from my mom, I dove right into it. An hour before we were supposed to arrive at this Danish family’s house (fortunately walking distance from my Kollegium), the kitchen atmosphere was what could call chaotic. We hadn’t finished cooking, and all of us tried rushing the process without ruining the food. All the stress in the end was worth it. The family set up a beautiful table for the 12 of us, the food was delicious, and no one could eat without a huge smile on his/her face. I have to say my sweet potatoes came out well. I guess I’m getting pretty domestic. If there’s anything I’ve learned from celebrating Thanksgiving in a foreign country (aside from having more faith in my ability to getting things done on time), it’s that spending an extended amount of time abroad should not just be about cultural absorption. DIS and so many other study abroad programs toss around the word “immersion” as if it’s the core of any abroad experience. As important as coming to understand and experience the culture of your host country, study abroad to me isn’t about immersion. It’s about sharing culture. On of my good friends couldn’t attend this Thanksgiving dinner because one of her classes was going to Tivoli for Christmas festivities. 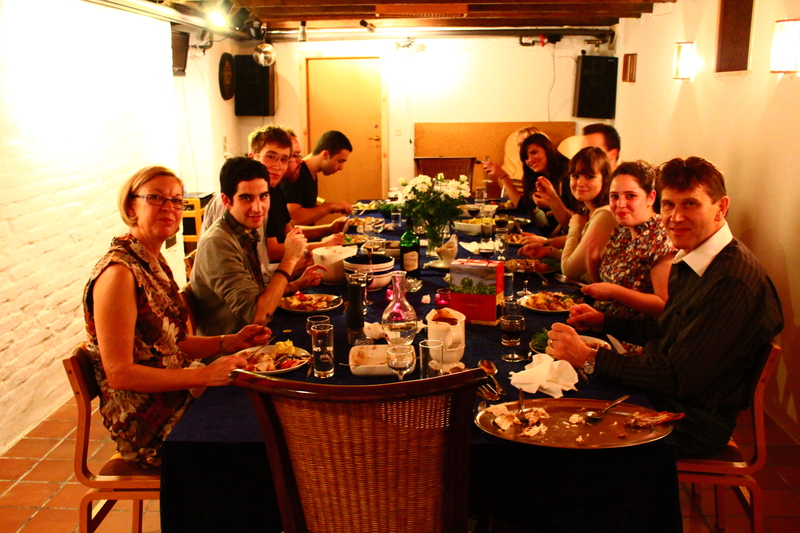 Knowing it was Thanksgiving, the professor urged the class to go because it would be a way for American study abroad students to experience how Danes celebrate the holiday season. That is, immersing themselves into the Danish way of life. I don’t think that’s what this whole semester should be about. Bringing the tradition of Thanksgiving to a Danish family that has never heard of such a holiday, and experiencing that holiday together. That’s sharing. Not only is that the point of Thanksgiving, but it’s also the point of study abroad. Sharing culture, not forfeiting one for the other. As great as immersion can be, sharing cultures allows you to both experience a different way of life and look back at your own with a fresh pair of eyes. And that’s why I’m so grateful I got to experience Thanksgiving in Denmark. However, nothing will ever compare to my mom’s stuffing and apple pie.